SONOMA, Calif. — Despite a brown haze in the air and the consistent drone of helicopters flying overhead, residents in the city of Sonoma are doing everything they can to get back to business. In the past week, more than 245,000 acres have burned across the state of California, and a dozen large wildfires are still burning. The wine industry generates more than $110 billion in economic activity every year and attracts 23.6 million tourists to the state of California annually, according to the Wine Institute. But now, those in wine country’s hospitality industry worry those tourists will take their dollars elsewhere. Already, according to latest estimates, Sonoma County has suffered $3 billion in losses due to nearby wildfires. Businesses with power and employees able to return to work have been scrappily keeping the doors open. The historic Sonoma Plaza — a park surrounded by restaurants and shops that usually attracts hordes of tourists this time of year — was without power until Tuesday. Some plaza businesses, like The Church Mouse, a thrift store, opened and began distributing donated clothes — for free — to local residents in need even before the store’s power was restored. At Crisp Bakeshop, a mile west of the Sonoma Plaza, owners Moaya Scheiman and Andrea Koweek returned last Tuesday at 4 a.m. to see if their building was still standing. Except for the smoky air, the shop was untouched. “Our employees were here. We were here. As we opened up, people started showing up. It was clear that it was important to be here,” Scheiman told NBC News. They have been open every day since, offering not just free coffee, tea, and cocoa, but a respite from smoky air, a place to recharge phones and computers and log on for free Wi-Fi. As customers streamed into the shop, many wearing protective masks, they thanked Scheiman for remaining open. Still, in the wake of the fires, many customers have canceled their visits, events, and weddings in the valley. Scheiman relies on the 170 wedding cake orders he fills each year, and says three of those orders have been cancelled already this week. “One month of lost business would close us down,” said a worried Scheiman, greeting customers and watching as pastries were packaged into tissue paper and white boxes. For small businesses like Crisp, attractiveness to tourists is everything. “The biggest loss to us will likely be lack of business,” said Patricia Shults of the Sonoma Valley Chamber of Commerce. “The thing that has struck me is the indomitable spirit of our community. We are a very resilient community,” she told NBC News. The marketing agency Sonoma County Tourism estimates that the fires actually impacted less than 10-percent of Sonoma County by acreage and that redwoods, rivers, and coastal areas in the county are unscathed. 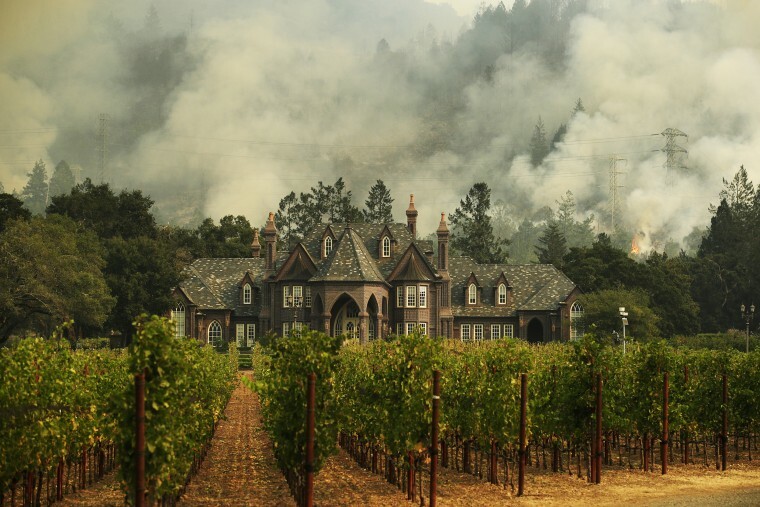 And, in the city of Sonoma, while thousands of people were evacuated, only structures in the city’s unincorporated areas were destroyed by fire. Sonoma resident Kelly McLeskey Dolata owns event design and planning company “A Savvy Event,” and says she has spent every day since the fires swept through postponing and moving wine country weddings elsewhere. McLeskey Dolata says September and October are normally her busiest months — accounting for half of her year’s bookings. For the first time in her career, McLeskey Dolata says she didn’t have an answer. She was eventually able to postpone the weddings to a nearby city, as she has with 11 weddings originally scheduled at Sonoma wedding venues in the next two months. One of McLeskey Dolata’s weddings was to be held at 160-year-old Sonoma winery Gundlach Bundschu. But, when the so-called Partrick Fire torched Mt. Arrowhead last week, it covered the winery in ash and destroyed the Bundschu family’s private residence. Despite damage on the Gundlach Bundschu grounds, Katie Bundschu hopes her family-owned winery can reopen this weekend. “Don’t be afraid to come to Sonoma,” said Bundschu, acknowledging that the valley will look a little different. “And have mercy on the 2017 vintage. It may not be a record-breaking year for collectors, but it will be a special vintage,” said Bundschu, with a cautious laugh. Other winemakers agree. “We live off these vineyards. We live off this land that was scorched this week,” said Sam Coturri of Winery 16600. “Keeping this wine industry flowing is how we recover,” he said.